… 25 House Democrats, including the ranking member of the House Judiciary Committee, are now pushing an equally radical alternative: They are backing a bill that would create a congressional “oversight” commission that could declare the president incapacitated, leading to his removal from office under the 25th Amendment to the U.S. Constitution. …Raskin, a former constitutional law professor, has seized on some largely overlooked language in Section 4 [of the 25th Amendment] as the basis for his bill. It turns out it doesn’t have to be the Cabinet that makes a finding of presidential incapacity. The section also permits “such other body as Congress may by law provide” — along with the vice president — to reach the same conclusion. Removal of the president under the 25th Amendment could be more difficult than impeachment. Impeachment requires the support of a simple majority of the House and then two-thirds of the Senate to remove the president. 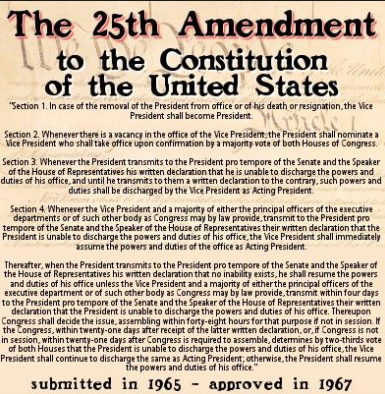 The 25th Amendment requires the Vice President to support the process. If the president should be declared to be incapacitated, he could then challenge the action. It would take two-thirds of both Houses to agree in order to prevent the president from being reinstalled in office. The advantage of this mechanism would be that it is much quicker than the full impeachment process, provided that the Vice President and super majorities of both Houses agree. It is far fetched that this could currently be done, but does provide an option if Trump’s behavior should deteriorate further to the point that there is agreement that he must be removed.